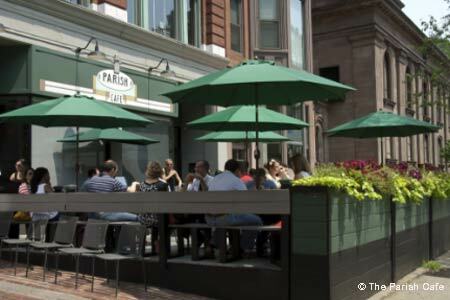 This Back Bay café remains popular thanks to a menu created by Boston chefs and bartenders. : Far from your run-of-the-mill Reubens and bland burgers, sandwiches at the Parish are singular one-of-a-kind creations from some of the city's most imaginative chefs. Take, for example, The Mexican Meatball sandwich created by Brian Poe (Rattlesnake Bar & Grill, Estelle’s and The Tip Tap Room), which features cilantro-laden meatballs fired up with chipotle on a crunchy baguette. Menu staples like The Blue Ginger from Ming Tsai, combining grilled rare tuna steak with wasabi aïoli and a teriyaki glaze, are already neo-classics. Non-sandwich fans can choose from a limited selection of appetizers, like onion rings and Jamaican jerk wings, salads, and comfort entrées such as a hearty “simple” chicken made with garlic, tomatoes, lemons and capers. The cocktails that accompany them follow the same formula. Among the inventions from some of Boston's best bartenders is The Southender from Jen Fields of Toro, made with vodka, mint, simple syrup and lemon. End the meal with white chocolate bread pudding. On those rare occasions when the execution doesn't capture the vision, the restaurant's lively vibe, both inside and out on the patio, compensates. At lunchtime on a warm day, brace for a lengthy wait.